On Friday I attended Johnson C. Smith University's ground breaking ceremony for Mosaic Village, the university's ambitious project to help revitalize the northwest corridor along West Trade Street and Beatties Ford Road. Mosaic Village is planned as a mixed-use development that will include 300 student apartments, retail space, and a parking deck. It's being constructed at 1601 West Trade St., which is next to The Arts Factory, JCSU's first off-campus facility that opened last fall. The ground breaking for Mosaic Village was actually followed by an official ribbon cutting for The Ats Factory and attendees were given a tour. This was all part of JCSU's Founder's Week Celebration. 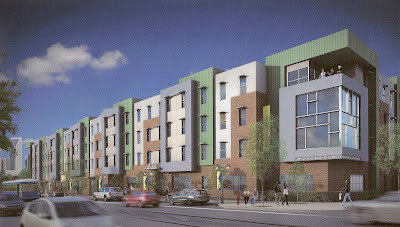 JCSU broke ground on Mosaic Village on Friday. This project is the latest effort in JCSU President Dr. Ronald L. Carter's vision to lead his historically black university beyond its traditionally closed gates and to not only improve the community around it, but to also strengthen the school's connection to Charlotte as a whole. Carter says he'd like to see Mosaic Village opened in 14 months, but that won't come without challenges, including a $4 million funding gap that the university has asked the City of Charlotte to assist with. Below is video I captured from Friday's ground breaking ceremony. There were a lot of people in attendance showing their support, including Mayor Anthony Foxx, City Councilman James Mitchell, Charlotte Center City Partners President Michael Smith, members of the Griffin family who own the land, and plenty of community and business leaders, alumni, and neighborhood residents. It's not often that you see such a variety of people coming together on this part of town.